Brda region is the region world famous for its excellent wines (taste orange wines), cherries and extra virgin olive oils. In the hills of Brda region, the landscape is amazing, a mixture of straight rows of vines in the vineyards, fruit orchards and olive groves. The olive trees in Brda region are the northernmost olive trees in Europe. Now there are more than 40,000 olive trees (120 ha). 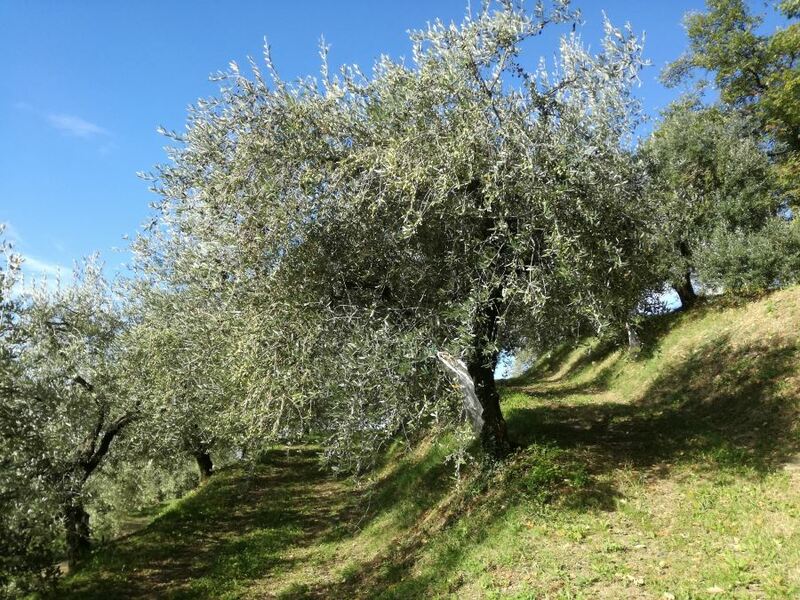 In recent years, new olive groves have begun to appear even in the northerly Brda region, where they were previously exceedingly rare. The olive trees in Brda region has been introduced by the Romans. In the 20th century various factors (big frost in 1929, new boarder between Italy and Yugoslavija (nowadays Slovenia)) led to a decline in olive oil production. After the year 1929, we can still find individual olive trees which started growing from the stumps of frozen trees in the villages Hlevnik and Slavče. These are the oldest olive trees in Brda region. In Slavče village a stone pot which was used to store olive oil can be found. However, after years of neglect, in 1978 Bruno Podverščič »smuggled« around 10 olive trees from Italy and shaped the oldest olive grove in Brda region. 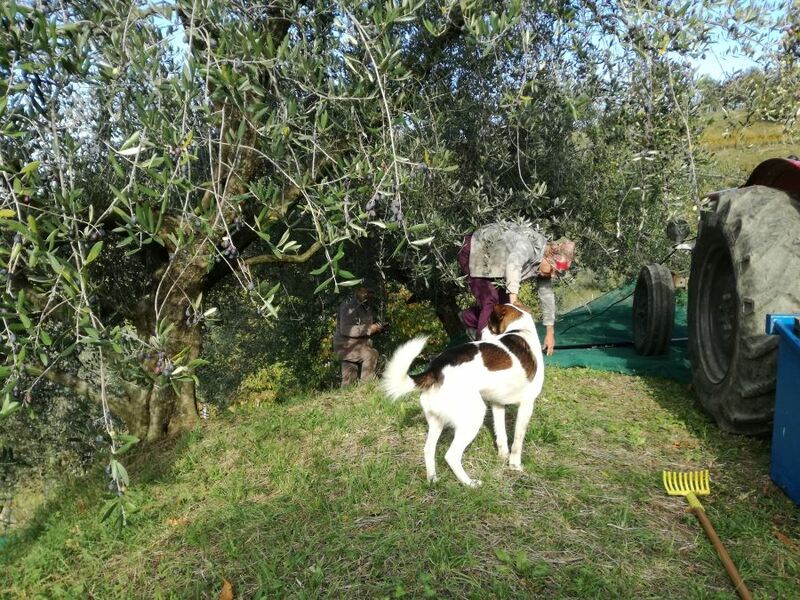 With perseverance and solid will Bruno convinced people that olive growing is a simple and profitable agricultural industry. While you explore Brda region through its wines, food and rich cultural heritage, do not miss to visit the highest lying olive grove in Europe which can be found close to Gradno village. Send me an email at vesna@slocally.com and get GPS coordinates for the olive grove in Gradno village. 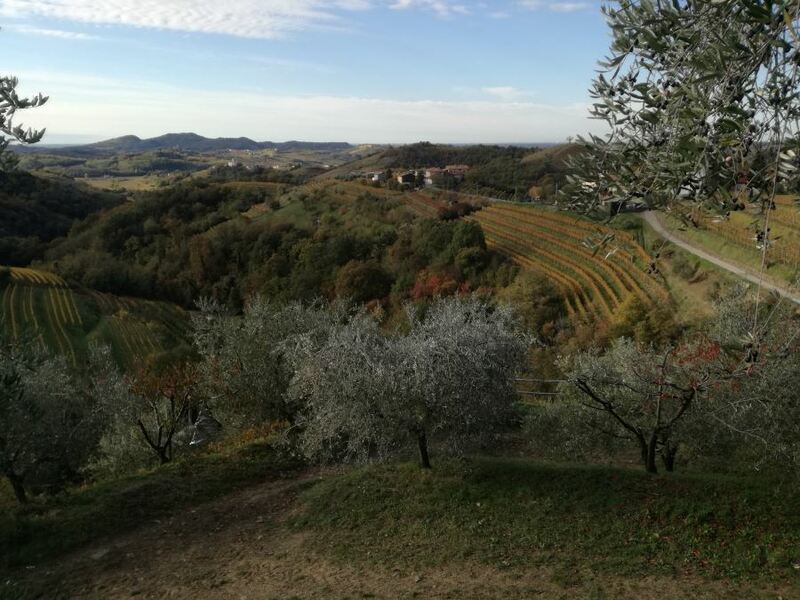 Brda’s climate is also perfectly suited for growing olives. 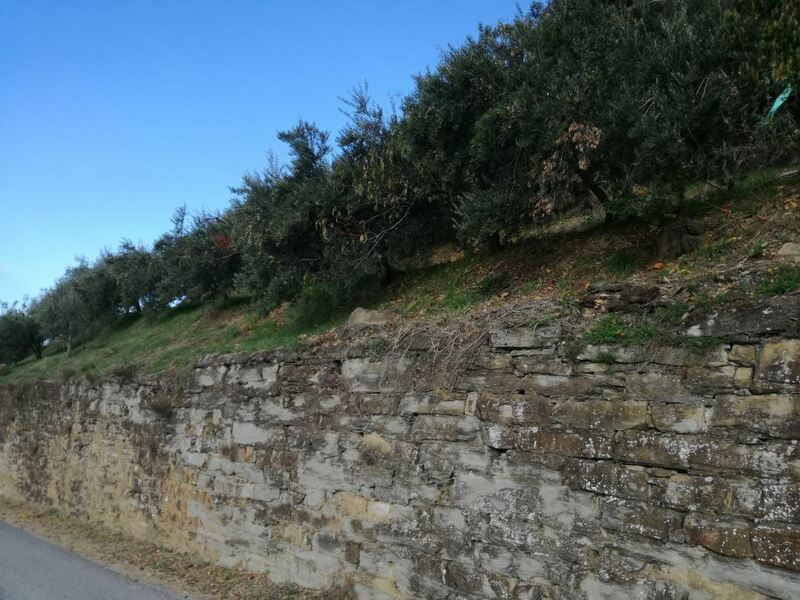 The olive trees are growing on steep terraced slopes. The somehow cooler climate of Brda region seems to benefit the quality of these olives. A lot of knowledge and care goes into harvesting, milling, and storing the olive oil. 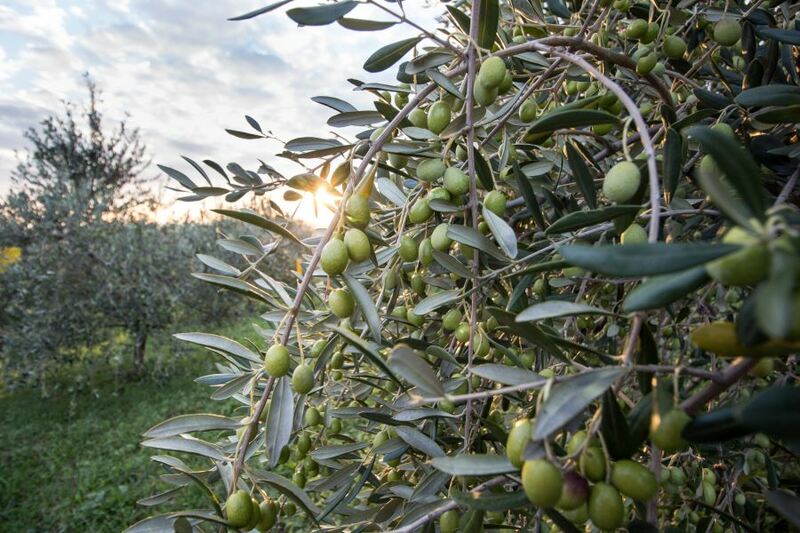 Generally, Brda olives are harvested between late October and mid November. 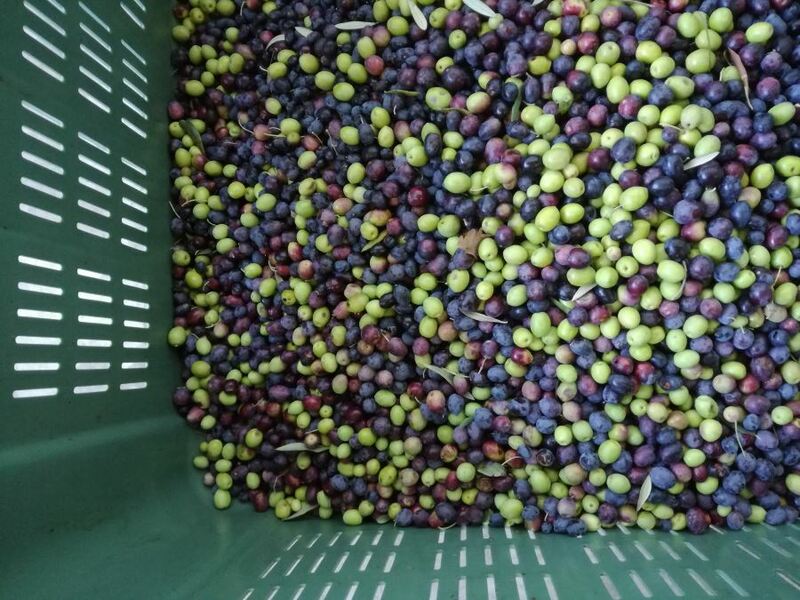 The fruit picking is manual and olives are transported to torkla/oil mill in small crates. The fruits are pressed immediately after picking. The olive juice is squeezed from the olives and not from the olive skins. The highest lying olive grove in Europe. 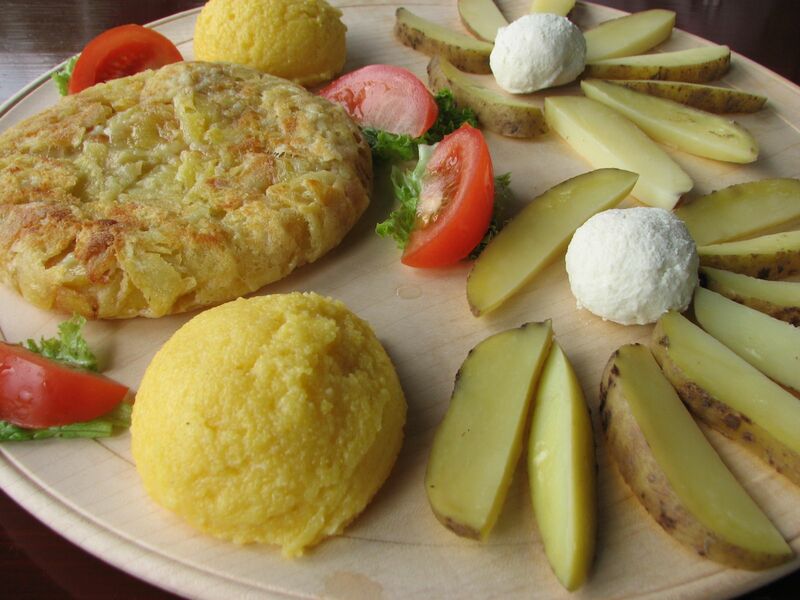 There are 2 autochtonous varieties in Brda region: Briška Drobnica (“small cattle”) and Črnica (“black earth”). While the most represented by number are Belica and Leccino. The production of olive oil in Brda is small though but its olive oil is being recognized internationally for its excellence. Olive oils from Brda region have a high number of antioxidants due to the northernmost position in Europe and very low acidity level which shows high quality of small quantities of top-notch olive oil. All of these characteristics are highly prized among olive oil connoisseurs. 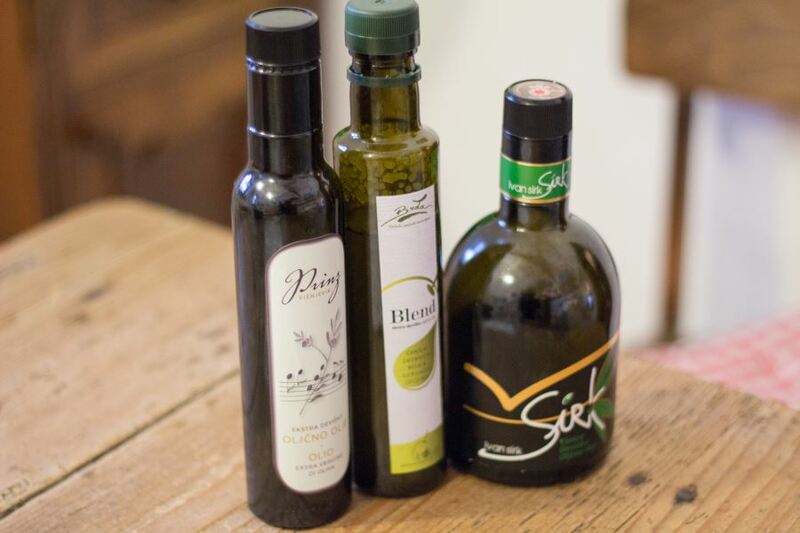 Various Brda olive oil producers have won international prizes for their excellent extra virgin olive oils. Attend Olive Oil Festival in April and get to know top-notch extra virgin olive oils. In a normal year the boutique production of Slovene olive oil is around 700 tons. Compared to the rest of the world, Slovenia and Brda region in particular, is a tiny spot on the world olive oil production map. The consumption of olive oil is slowly growing, on average 1 liter per person is consumed (most olive oil is consumed in the coastal area! 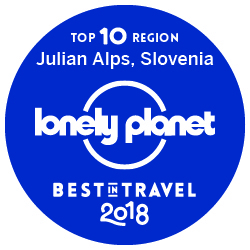 ), that is 2000 tons/year in Slovenia. 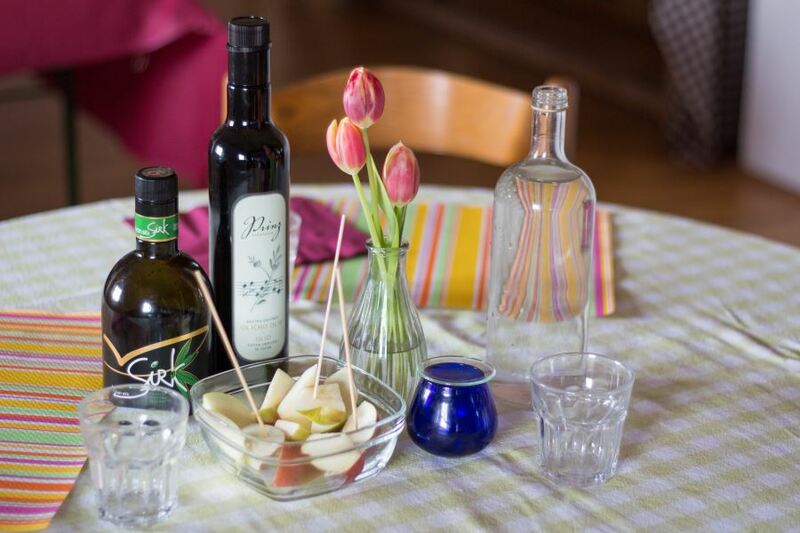 Šmartno village hosts the only olive oil bar in Slovenia. 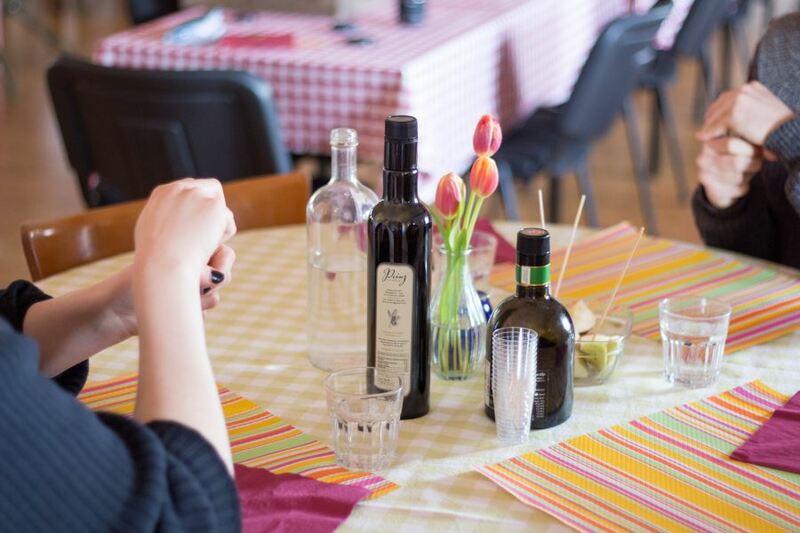 Grab an opportunity and take a place at olive oil tasting which is provided by Hiša Kulture. Tatjana is a truly olive oil connoisseur who provides a vast information on Brda region and olive oils in particular. 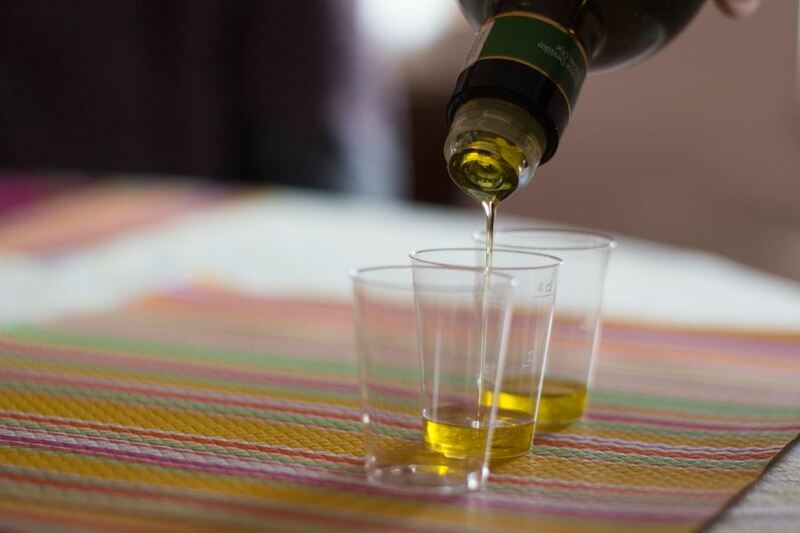 Olive oil tasting is the perfect opportunity for everyone to discover the fascinating world of olive oil. 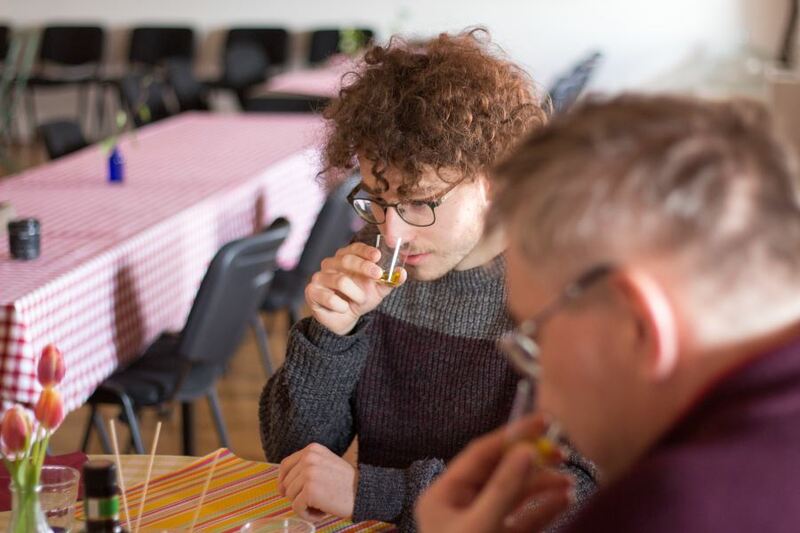 At the olive oil tasting you learn how to distinguish between good and bad oils, read the label properly because it matters what kind of an olive oil you buy and how you store it, right? At the round table olive oil tasting takes place where 3 different extra virgin olive oils can be tasted. Every extra virgin olive oil should be fruity, bitter and spicy (or pungent) without any defects. … and spreading it around the mouth cavity. 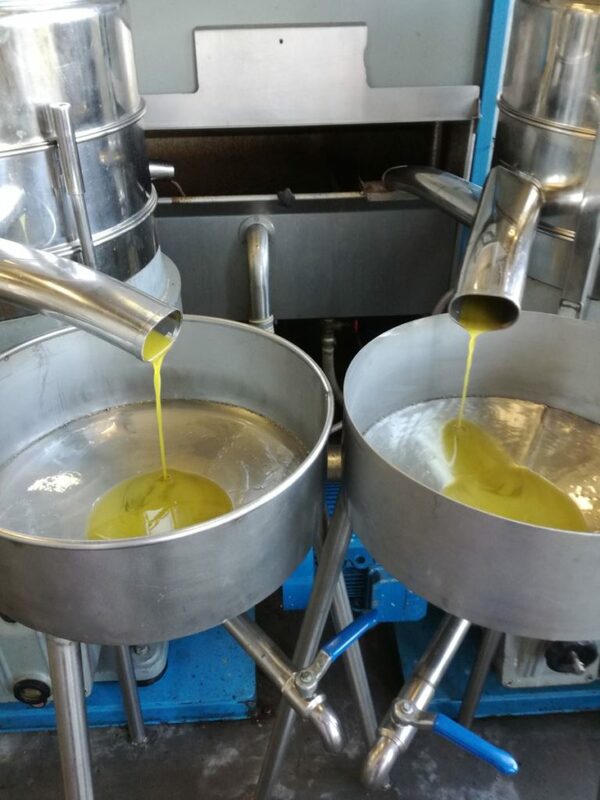 By warming the oil in the palm of our hand (bring out the oil’s aromas), inhaling it through the nose and spreading it around the mouth cavity, we step into the fascinating world of extra virgin olive oils. 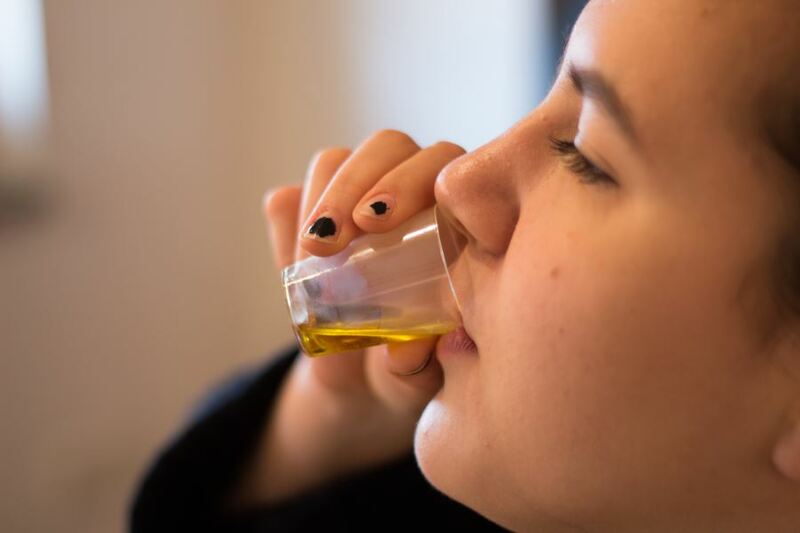 On a guided olive oil tasting led by Brda tasting panel member Tatjana you get acquainted with briška drobnica, briška črnica and olive oil with lemon. Tasting olive oils is the best way to determine quality and flavor. 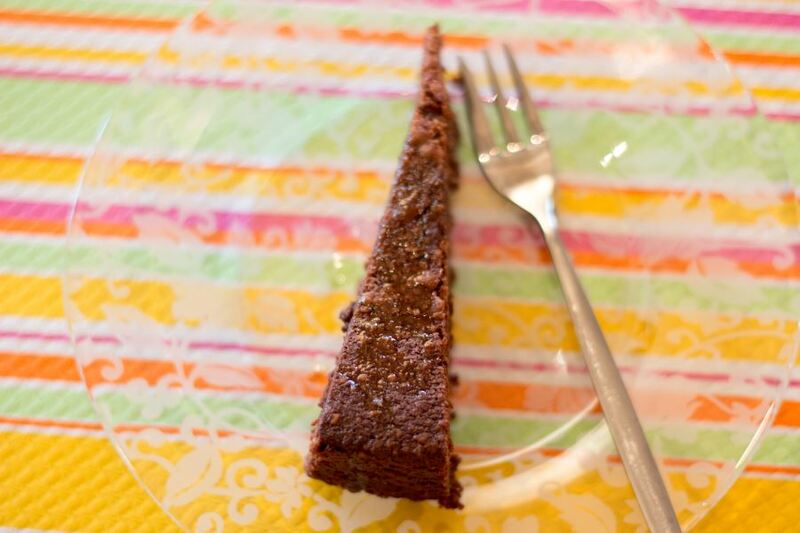 Last but not least, olive oil does not get better with age – it is best when fresh. It offers a multitude of health benefits so make sure you are treating them properly. Time: every day at 10 am or 4pm by prior arrangement. olive oil reduces the risk of cardiovascular disease, helps boost the immune system, lowers high blood pressure, decreases one’s risk for heart disease and the risk of breast cancer, improves blood sugar control, improves bone mineralization and calcification. Hi from Finland. Very interesting post! I thought olive doesn’t grow that north. I will definitely buy some oil when I’ll come to Slovenia.